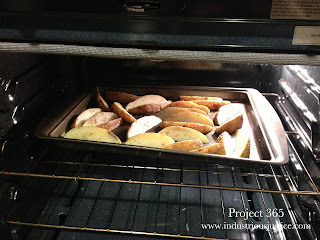 One of my new favorite potato side dish recipes is oven roasted potato wedges. You just cut some potatoes into wedges, toss them with olive oil, garlic powder, salt and pepper, pour them onto a baking sheet, and bake them for 35-40 minutes at 450 degrees, shaking them around a bit halfway through. I need to remember to do roasted veggies more! I love them and they are so easy.